As well as being Galicia's capital, Santiago de Compostela is also one of the world's great pilgrimage destinations, a magical city, of stone, arcaded streets and numerous beautiful churches and cathedrals. Many of the best places to stay in Galicia can be found here, but there are plenty further afield too. But your pilgrimage into Galicia needn't stop there. Venture coastward to a region of cliffs, beaches, and arguably Spain's best seafood restaurants - Vigo and Pontevedra should not be missed. Explore the lush interior with its smattering of stone farming villages and vineyards - producing more of Spain's famous bounty. Allariz is a good base for inland exploring. It's just 15km from the provincial capital Ourense, and boasts a medieval centre and a festival slightly akin to that in Pamplona (though Allariz's Ox Festival only features one bull!). Or visit some of the region's other cultural hubs, including A Coruña, home of the Tower of Hercules. A stroll through almost any of Galicia's towns of cites will be a rewarding, historic experience, and also a rewarding one for the gourmet. This is also a great country to drive around, with some exceptionally beautiful views. Embark on a section of the pilgrimage trail to Santiago de Compostela. Wander through the architecturally rich streets of historic Santiago de Compostela. Unwind on some of Spain's least crowded beaches. Discover the provincial capital, Ourense and admire its medieval centre. Visit the Tower of Hercules in A Coruña. But be aware it's a popular destination during the summer months. So if you want to book one of the best places to stay in Galicia in July or August, you'll need to be organised and book ahead. Otherwise go in the quieter months when it'll feel like you've got the place to yourself. O Portelo is a simple hotel in the heart of Allariz. Rooms are traditional and rustic - think exposed beams and stone walls and plenty of charm. 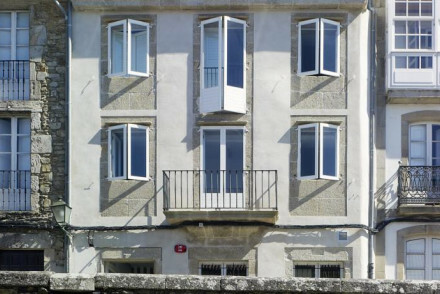 Quinta de san Amaro in Pontevedra offers fourteen bedrooms with a pool for the summer - though the beaches of the Rias Baixas are just ten minutes away - and a cosy library for the winter. Surrounded by fragrant fruit trees, it's a quiet, chic and gourmet escape. Plus rooms starting from just £79 per night. 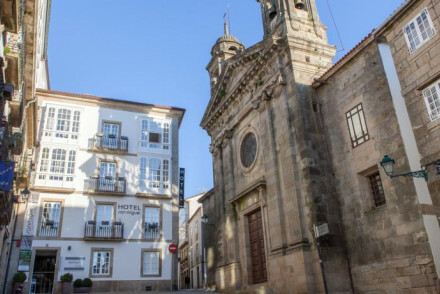 Costa Vella in Santiago de Compostela, is a charming, 14 room hotel right by the cathedral. Rooms have huge windows, some of them overlooking a beautiful central courtyard garden filled with magnolias and fountains. Rooms start from £43 per night. 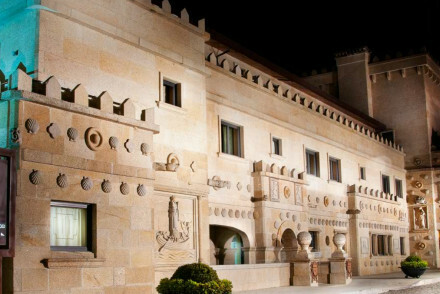 Palacio de Bentraces is a stunning Spanish nobleman's house in a quiet village just outside of Ourense. A lot of attention has been paid to the luxurious detail in the four rooms and there are some lovely art and antiques. Plus beautiful gardens, a large pool and delicious Galician food on request. 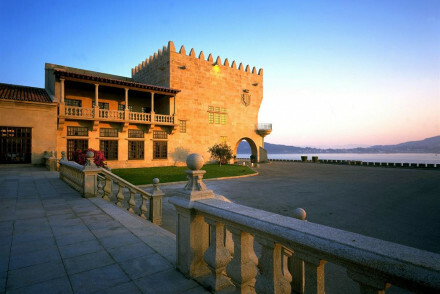 Parador de Baiona in Balona is a palace of a hotel sitting right on the edge of a peninsula. As well as having great beach access this hotel has spectacular views. The interiors are traditional and elegant. Pazo la Buzaca is a beautiful Galician manor house set amongst the rolling hills of Pontevedra. The 13 rooms are romantic and chic with balconies overlooking the countryside. There is an excellent restaurant. 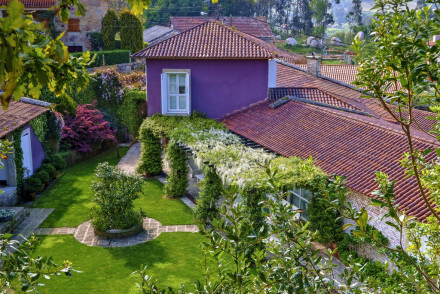 A Quinta de Auga is a classic spa hotel just outside Santiago de Compostela. The gardens are lovely, food gourmet and the rooms are luxurious. Pazo los Escudos is a five Star beach facing hotel and spa resort. Contemporary classic rooms and suites with all the mod cons and some with balconies. Elegant living areas, state of the art spa, excellent restaurants and direct beach access. Hotel Lois sits in the centre of A Coruña, only a few minutes' walk from the beach. The rooms are all decorated in a contemporary fashion and the hotel boasts an on site restaurant specialising in typical Galician dishes. An understated, modern hotel in the centre of Santiago de Compostela. Moure features original exposed walls blended with simple white on white colour schemes to create a stylish contemporary look. 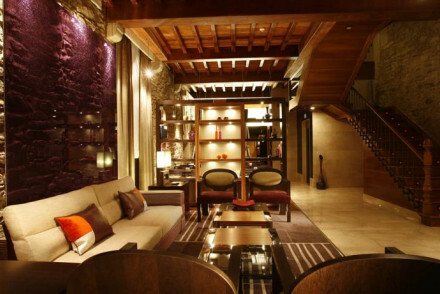 Pazo de Altamira chic boutique hotel set in a historic building in the Plaza de Abastos Square. White on white throughout with subtle splashes of modern art. 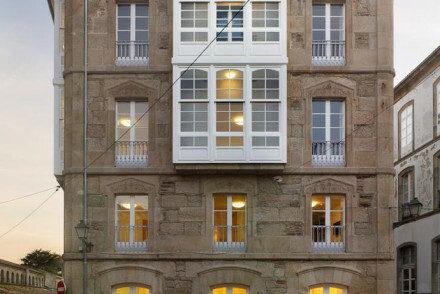 Hotel Inffinit is a modern hotel in historical part of Vigo. Elegant rooms have floor-to-ceiling windows, sleek furniture, wooden floors and big marble bathrooms. Large balconies to enjoy views over the city and breakfast is served in a light-filled dining room. In the heart of the city located in a quiet street, Altair Hotel has been designed to provide luxury and comfort to its explorers. Rooms feature original stone walls combined with contemporary style furniture and luxe amenities. Hotel San Miguel is a historic property with an enviable location in the charming pedestrianised area of Santiago de Compostela. Tradition meets modernity in the rooms; polished wood, large sash windows and contemporary bathrooms. An excellent restaurant brings regional cuisine onto a modern plate. A Casa da Torre Branca is a beautifully renovated 17th century farmhouse offering chic and cosy rooms in a village setting. Natural stone walls, exposed beams and period furniture add rustic charm. Rectoral de Cobres is a chic countryside hotel. Rustic rooms feature mahogany furniture, French windows leading to balconies, crisp white furnishings and stone details. Outdoor pool, stone courtyard and ivy-clad terrace. Slick Spanish restaurant. 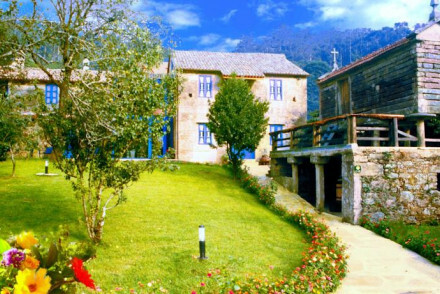 Torre do Rio is a charming countryside hotel in rural Galicia. The individually decorated rooms are elegant and comfortable with balconies facing out onto the surrounding gardens. Casa Louran is a pretty country house situated in lovely countryside. Exposed stone walls, large open fireplaces and beamed ceilings all give a homely traditional feel. Gorgeous regional cuisine cooked using products coming from their own organic farms. Convento de San Benito is a historic monastery with stunning sea-views. Lovingly converted rooms, all individually styled, with warm hues, antique furniture and parquet flooring. Cosy reception rooms complete with fireplaces and exposed stonework are ideal for whiling away a relaxing evening. 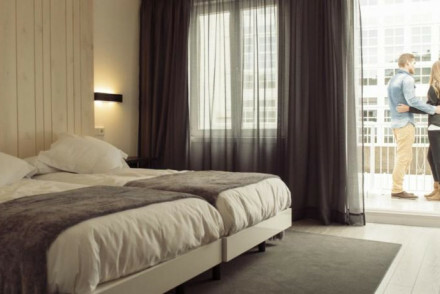 Hotel Puerto Gamboa is a charming town house hotel well located in central Vigo. Gorgeous traditional rooms boast large private balconies, polished wood floors, chintz fabrics and luxury bathrooms. Casa Perfeuto Maria is a family-run rural property situated in gorgeous countryside. Beautifully renovated throughout highlighting cosy traditional features such as open fires and exposed stone walls mixed with contemporary glass walls and open spaces. 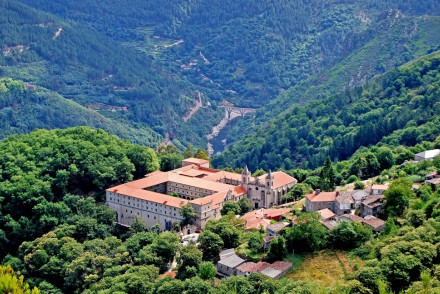 Parador de Santo Estevo is a beautiful monastery conversion surrounded by rolling hills and wooded valleys. Contemporary chic bedrooms and suites have simple furnishings and all the mod cons. Casa do Castelo de Andrade is a beautiful country house with luxurious interiors. Rustic but immaculate rooms and salons; stone walls, open fireplaces, attractive furniture, balconies, reading areas. A pretty country house in an unspoilt area of Spain. 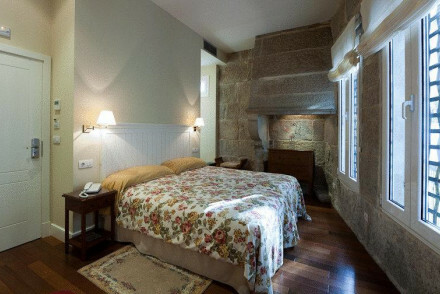 Casa do Mudo offers country style rooms with floral fabrics, exposed stone walls and traditional furnishing. Home cooked regional meals provided in the restaurant. 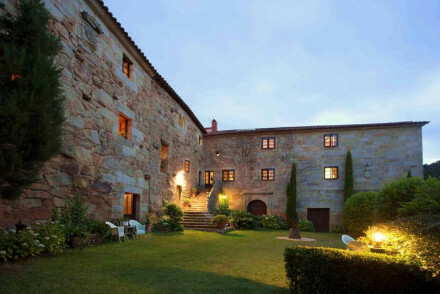 Palacio de Bentraces is a stunning Spanish nobleman's house in a quiet village just outside Ourense. Superbly luxurious rooms and suites are traditional and filled with art and antiques. Beautiful gardens, large pool, and delicious Galician cuisine by request. 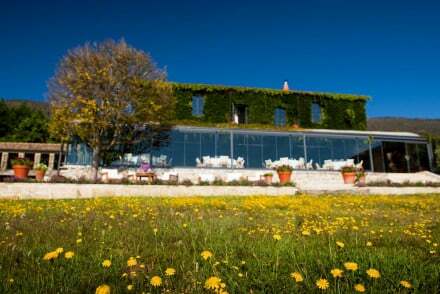 A beautiful farm-turned-hotel, in the rolling Galician countryside. 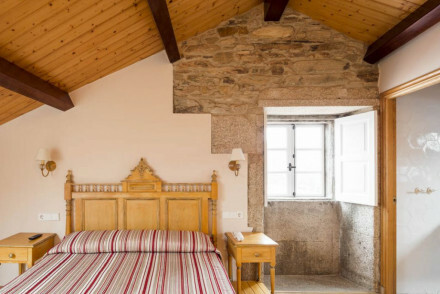 Os Lambrans' spacious rooms carry a simple elegance, with exposed stone walls and wooden flooring. With the option of taking over a whole six person apartment, it's perfect for a family holiday. A Quinta de Auga is a classic contemporary hotel. Opulent rooms have rustic-style wallpapers, luxurious bathrooms, wooden floors and baroque furniture. Hotel on the sea in Cariño, designed by Jorge Cao Abad. Hotel A Miranda's large guestrooms have mountain or sea views, marble bathrooms, accents of colour and wood. 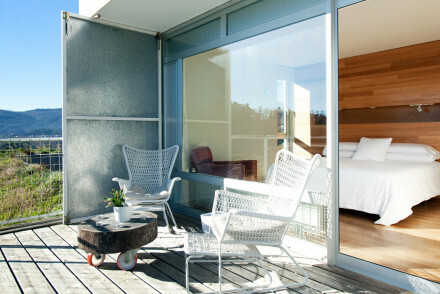 El Castano Dormilon is a lovely hotel and restaurant, along Galicia's virgin coastline. Rooms are chic with sleek modern furniture complimented, by natural stone walls and wooden frames. Parador de Baiona is a palatial hotel on a peninsula with beautiful sea views and access to beaches and attractions around. Traditional elegant interiors boast wooden floors, chandeliers, opulent furnishings and fireplaces. Galicia has three international airports (A Coruña, Santiago de Compostela and Vigo), of which the main one is at the capital, Santiago de Compostela. Galicia, unlike other parts of Spain, has four distinct seasons. It is also know as Spains rainy region. However the summers are warm and its reputation keep away the hoards of crowds that descend on other areas. The months of July and August see the most consistent sunshine. Browse through our list of all the best places to stay in Galicia. Widen your search to include all our recommendations in neighbouring Asturias. A beautifully renovated 17th century farmhouse offering chic and cosy rooms in a village setting. Natural stone walls, exposed beams and period furniture add rustic charm. Fresh food is served in the restaurant with a good selection of Spanish wines. A charming authentic delight. Back to Nature - In a rural setting, surrounded by greenery, this place comes with the tranquility of a countryside. Local exploring - Close by to town area to enjoy taverns, restaurants and shopping. Country Escape - Lovely views of the Galician countryside from room windows. Value chic - Well priced rooms for the chic accommodation and services. A pretty country house situated in lovely countryside. Exposed stone walls, large open fireplaces and beamed ceilings all give a homely traditional feel. Gorgeous regional cuisine cooked using products coming from their own organic farms. Numerous outdoor pursuits in the area. Rural bliss. Country Escape - Open fires, home-cooked food and unspoilt countryside to explore. Less £ - Prices start from just €52 per night including breakfast! Sights nearby - A number of nearby monuments of historic interest including the Monastery of Caaveiro Monfero and the Tower of Andrade. Great walks - Endless hiking trails through the Fraga run. The hotel will be happy to advise on good routes. A historic monastery with stunning sea-views. Lovingly converted rooms, all individually styled, with warm hues, antique furniture and parquet flooring. Cosy reception rooms complete with fireplaces and exposed stonework are ideal for whiling away a relaxing evening. Totally charming. Value chic - Reasonably priced elegant rooms in a stunning old monastery, just minutes from the beach, with original chapel and a cloister. Local exploring - A historically interesting property in a quaint fishing port and within easy access of the area's attractions. Sights nearby - A half hour drive will take you to Viana do Castelo where one can visit its cathedral, Eiffel bridge and romanesque remains. Great walks - Head out to explore this fascinating Galician fishing port on foot. A traditional hotel in completely natural and secluded setting. Rooms feature open beams, dark wood furniture, and private balconies. 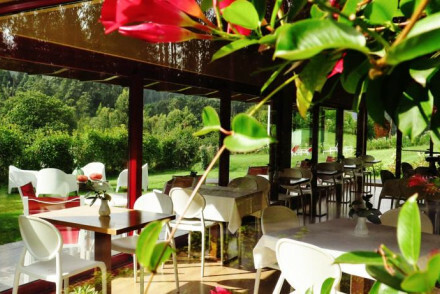 Excellent local cuisine, a cosy library, open terraces with spectacular views over the Asturian hills. Walking distance to the town; ideal for a country escape. A family-run rural property situated in gorgeous countryside. Beautifully renovated throughout highlighting cosy traditional features such as open fires and exposed stone walls mixed with contemporary glass walls and open spaces. Regional home-style cuisine. An ideal base for exploring the outdoors. Total relaxation - A rural home that celebrates the slow-life: reading a book by the fire or going for a stroll through the countryside. Active Holiday - Situated in ideal surrounds for all sorts of outdoor pursuits. You'll find something for everyone here. Sailing - Take a scenic boat tour along the Ria. Chic countryside hotel. Rustic rooms feature mahogany furniture, French windows leading to balconies, crisp white furnishings and stone details. Outdoor pool, stone courtyard and ivy-clad terrace. Slick Spanish restaurant. Pretty, quiet and wonderful value. A charming town house hotel well located in central Vigo. Gorgeous traditional rooms boast large private balconies, polished wood floors, chintz fabrics and luxury bathrooms. A small restaurant serves up home-style Galician delicacies. A delightful stay, ideally positioned to explore the city. Sights nearby - Visit the magnificent Concatedral de Santa María. Great walks - Take a scenic stroll along the marina. Hotel Lois sits in the centre of A Coruña, only a few minutes' walk from the beach. The rooms are all decorated in a contemporary fashion and the hotel boasts its own on site restaurant specialising in typical Galician dishes. 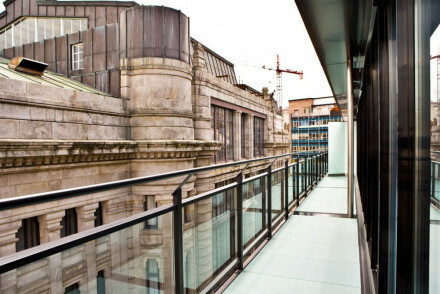 With easy access to the sights, it's perfect for a city break! 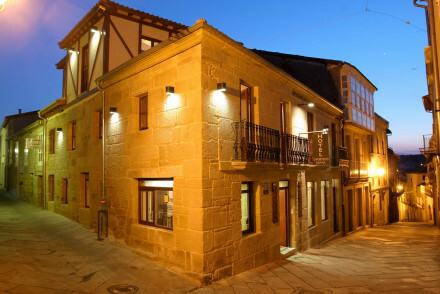 A charming hotel close to the Cathedral of Santiago de Compostela. Rooms feature open beams, light wood furniture and huge windows. A beautiful courtyard garden filled with magnolia trees, vines, and fountains. An unbeatable location for exploring this historic Spanish town. Excellent value. An understated, modern hotel in the centre of Santiago de Compostela. Original exposed walls are blended with simple white on white colour schemes to create a stylish contemporary look. With the city's world famous cathedral nearby, it's a great place to stay for a weekend in Santiago. Local exploring - A chic and sophisticated choice for exploring the sights of Santiago de Compostela, just five minutes from the Cathedral. Sights nearby - Five minutes walk from the UNESCO World Heritage Santiago de Compostel Cathedral. Great walks - A great place to stay after completing the Camino de Santiago. 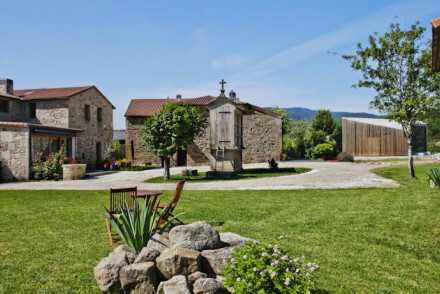 A beautiful monastery conversion surrounded by rolling hills and wooded valleys. Contemporary chic bedrooms and suites have simple furnishings and all the mod cons. State of the art spa, excellent restaurant, and beautiful views from sprawling terraces. Romantic, relaxing, enclosed by nature. Sights nearby - Gargantas del Sil, Adegas Valcar. 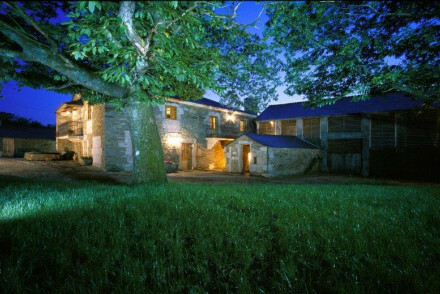 A beautiful farm-turned-hotel, in the rolling Galician countryside. 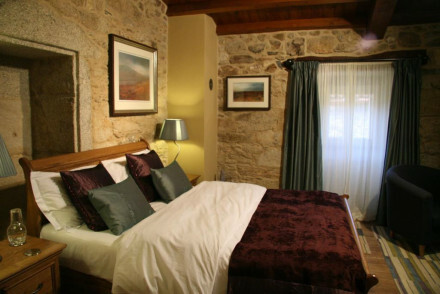 Its spacious rooms carry a simple elegance, with exposed stone walls and wooden flooring. With the option of taking over a whole six person apartment, it's perfect for a family holiday. 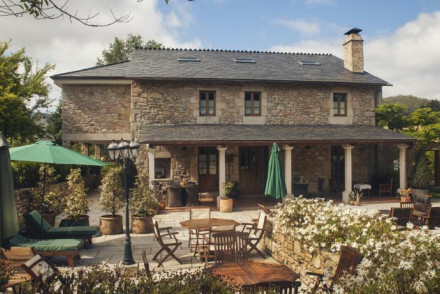 Country Escape - A romantic country escape in the lovely Río Sar region, surrounded by beautiful countryside and not far from the Galician coast. Eco break - Guilt free holidaying at Os Lambrans, they use biomass and solar panels to heat water and underfloor heating. Great walks - There are plenty of trails and beautiful walks in the area and on the nearby river Sar. Sights nearby - Santiago de Compostela is only 25 minutes drive away. A beautiful country house with luxurious interiors. Rustic but immaculate rooms and salons; stone walls, open fireplaces, attractive furniture, balconies, reading areas. Lovely gardens, excellent restaurant, golf, riding, walks in the national park. A romantic spot for a country escape. Sights nearby - Many monasteries around. 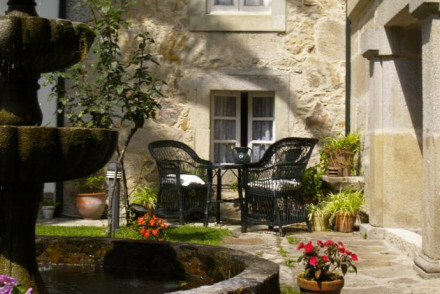 A delightful hotel in the countryside of Pontevedra. Elegant rooms feature wooden floors, valley views and frescoes. An outdoor pool, cosy library, and a fragrant fruit tree garden. Outstanding Galician cuisine. Quiet, chic, gourmet. Great for a romantic escape. Hotel on the sea in Cariño, designed by Jorge Cao Abad. Large guestrooms have mountain or sea views, marble bathrooms, accents of colour and wood. Larger suites are across two floors and have fireplaces. Great value restaurant offering Galician menu. Fantastic value beach stay. A chic boutique hotel set in a historic building in the Plaza de Abastos Square. White on white throughout with subtle splashes of modern art. Light and airy rooms feature large sash windows with lovely city views. A bohemian restaurant with Galician roots at the heart of the cuisine. A trendy spot. Great walks - Walk up to the Monte de Gozo or the ‘Mountain of Joy' and, like pilgrims before you, take in the view of the cathedral. Sights nearby - Visit the The majestic Cathedral of Santiago de Compostela and its square Praza do Obrodoiro. 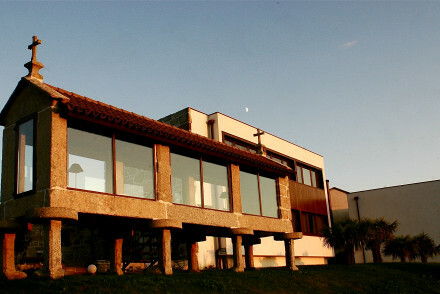 Elegant 800 year old country house in the heart of the Galician countryside. Charmingly rustic, all rooms have exposed stone walls and chestnut beams, earthenware and wildlife artwork alongside all the mod-cons. A tranquil base to explore the region from. Back to Nature - Galicia, the "Land of the Thousand Rivers". Nearby are rolling green fields, woodland and on the coast, pristine beaches. Sights nearby - Marvel at the UNESCO World Heritage Roman walls that run round the city of Lugo. Modern hotel in historical part of Vigo. Elegant rooms have floor-to-ceiling windows, sleek furniture, wooden floors and big marble bathrooms. Large balconies to enjoy views over the city, and breakfast is served in a light-filled dining room. Central and good value. A Five Star beach facing hotel and spa resort. Contemporary classic rooms and suites with all the mod cons and some with balconies. Elegant living areas, state of the art spa, excellent restaurants, and direct beach access. Pampering for the luxury traveller. Sights nearby - Castrelos Auditorium, Castrelos Park, Balaidos Stadium, Plaza America. In the heart of the city located in a quiet street, this boutique hotel has been designed to provide luxury and comfort to its explorers. Rooms feature original stone walls combined with contemporary style furniture and luxe amenities. Enjoy the delicious breakfast and informal onsite bar. Local exploring - Set in a superb location with monuments, bars, restaurants and the cathedral all just out the front door. Local markets - Go on a guided tour of the Old Town and discover the wide range of art galleries and monuments. Sights nearby - Discover the monastery of San Martin Pinario. A lovely hotel and restaurant, along Galicia's virgin coastline. Rooms are chic with sleek modern furniture complimented, by natural stone walls and wooden frames. Candlelight dinners and Galician wines are the norm here. Comfortable accommodation and fresh seafood in a romantic rural setting. Total relaxation - The perfect spot to sit back and relax in serene surrounds- enjoy reading in the garden or feasting on regional cuisine. Beach Life - The northern coastline of Galicia is well known for its cliffs, bays, beaches and estuaries. Birdwatching - Twitchers will be pleased to know there are many interesting species of birds found in this area. Great walks - Walk through the town of Santiago de Compostela, soaking up all its history. A pretty country house in an unspoilt area of Spain. Country style rooms with floral fabrics, exposed stone walls and traditional furnishing. Home cooked regional meals provided in the restaurant. Tranquil gardens to unwind in with a glass of wine. Ideal for a relaxing country escape. 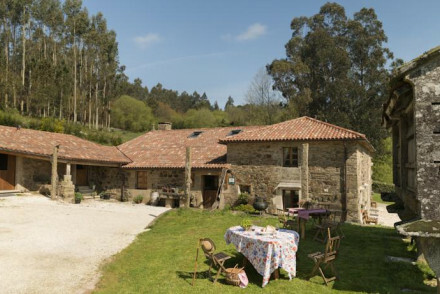 Country Escape - A quaint country house in unspoilt countryside near the pretty Galicia coast. Great walks - Take a coastal walk along the cliffs of Loiba. A palatial hotel on a peninsula with beautiful sea views and access to beaches and attractions around. Traditional elegant interiors boast wooden floors, chandeliers, opulent furnishings and fireplaces. Fantastic restaurant, swimming pools, and spa. A great choice for a romantic beach holiday. Sights nearby - Monterreal Castle. Simple yet charming hotel in the heart of historic Allariz. 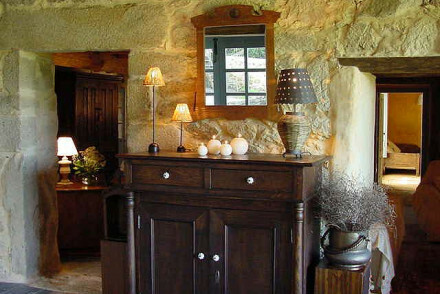 Rooms are traditionally furnished and rustic in style with wooden beams and exposed stone walls. Perfectly situated to explore both the town and surrounding area of Galicia and Northern Portugal. Sights nearby - 20 mins from Ourense, an hour from Santiago de Compostela. Views - Views of the city. The perfect location for a restorative break in the heart of Vigo. 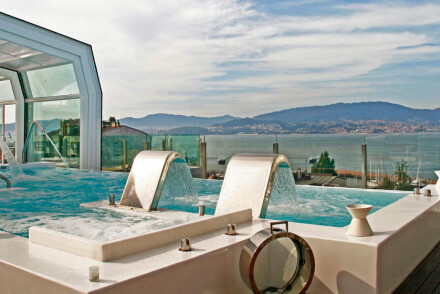 A plethora of massages and treatments are offered by the luxury spa, coupled with a rooftop pool and bar that boast stunning views of the Galician coastline - a chic yet understated hotel not to be missed. 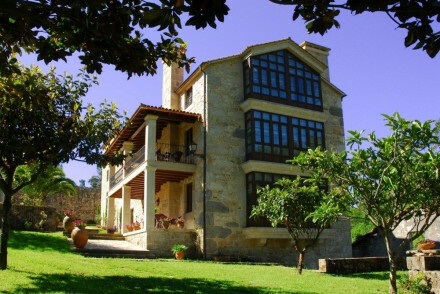 A stunning Spanish nobleman's house in a quiet village just outside Ourense. Superbly luxurious rooms and suites are traditional and filled with art and antiques. Beautiful gardens, large pool, and delicious Galician cuisine by request. The perfect romantic escape. Romantic Break - The perfect romantic spot. Sights nearby - Just outside all the sights in Ourense. A historic property with an enviable location in the charming pedestrianised area of Santiago de Compostela. Tradition meets modernity in the rooms; polished wood, large sash windows and contemporary bathrooms. An excellent restaurant brings regional cuisine onto a modern plate. Fantastic. Local exploring - Well situated overlooking a small square in the historic centre, within walking distance of many of the sights. Sights nearby - Just 200 m from the famed Santiago Cathedral, a fascinating sight for any culture vultures. Local markets - Take a walk around the Central Market and sample the local delicacies. A family-run winery and hotel in picturesque Galicia featuring an outdoor pool, gym and chic accommodation. Elegant rooms are individually styled with antiques, Egyptian cotton sheets and luxurious bathrooms. A tranquil adults only rural retreat. 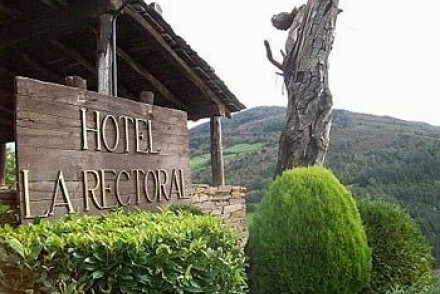 A charming countryside hotel in rural Galicia. The individually decorated rooms are elegant and comfortable with balconies facing out onto the surrounding gardens. Try local Salnés cuisine in the hotel's restaurant. Perfect for couples looking for a relaxing, intimate holiday. Romantic Break - Brimming with charm and intimacy, the hotel is perfect for an intimate and romantic break in Gallicia. Country Escape - An chanting rural retreat set in lovely landscaped gardens, and surrounded by the River Umia. Fishing - Anglers will be pleased to learn that the nearby river offers trout fishing. Great walks - Several walking trails start from the house and lead through rural Galicia. Classic contemporary hotel. Opulent rooms have rustic-style wallpapers, luxurious bathrooms, wooden floors and baroque furniture. Indoor pool, spa, games room and lovely gardens. Excellent regional cuisine in romantic restaurant. Pretty, relaxing and good value. A beautiful Galician manor house with a long family tradition. Set in the rolling hills, it has beautiful views over sprawling greenery. Romantic chic bedrooms, traditional in style, with attractive bedrooms and balconies. 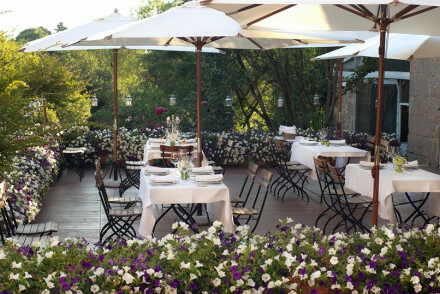 Excellent restaurant, gardens, pool, and lots to do in the countryside.